If there is any one secret of success, it lies in the ability to get the other person's point of view and see things from his angle as well as from your own. In one context or another, we are all salespeople. While most people would probably characterize "selling" as a formal process of being actively engaged in persuading another to exchange something of value for a particular product or service, the reality is that all of us engage in selling behaviors to some degree on a daily basis. Whether or not we are consciously aware of it, any time we attempt to influence another person's thoughts or behavior through our words and actions, we are selling. Similarly, whenever someone is attempting to influence our thoughts and behaviors, we are being sold. The ability to influence the behavior of others has been a basic element of human culture since the dawn of mankind. Selling can take many forms and employ a variety of approaches. For example, it can involve a hard sell characterized by a straightforward, forceful and overt sales style or a soft sell that uses a more subtle, casual, or friendly sales message. A more fundamental distinction, however, can be made with regard to whether the focus of the sales message is on what the salesperson wants or what the prospect wants. We at Symbiont Performance Group are committed to the premise that in today's business reality, the path to success in selling is the one that centers without exception, on the needs of the prospect. Customer-Focused Selling is a selling concept that places the total emphasis on the needs of the prospect. In the words of Dale Carnegie, a pioneer in the self-improvement movement, "The only way to influence the other fellow is to talk about what he wants and show him how to get it." Customer-Focused Selling is a selling technique that emphasizes a genuine dialogue between the salesperson and the customer. Before talking product and/or service, a customer-focused salesperson strives to uncover a customer's underlying personal and/or professional needs and may even help the customer identify and phrase these needs. Then, instead of delivering a standard sales pitch about a product or service, the salesperson presents a tailored solution that meets the customer's needs, using the customer's language. 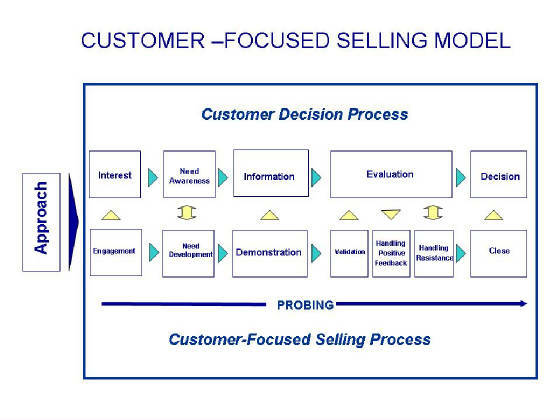 Customer Focused Selling is a consultative selling format. Rather than using the traditional selling strategy of stressing product/service features in the hope that something in the sales presentation will strike a positive chord with the prospect, a consultative sales approach focuses on effectively uncovering and gaining agreement on important but heretofore unmet customer needs. Once brought to the service, the customer-focused salesperson will the align product/service benefits to those unmet customer needs, thereby creating a sale that mutually benefits both salesperson and prospect. They provide customized (as opposed to generic) solutions. Their calls are more interactive. The sales model depicted above aligns the customer decision progess with The Symbiont Performance Group selling process to creat a WIN-WIN selling strategy that genuinely meets both customer and seller needs. A major advantage of this selling model is that it allows a salesperson a great deal of flexibility in presenting and responding to a customer. It permits a salesperson to effectively adjust his or her presentation to the customer's responses and serves as a selling road map for the achievement of of a mutually satisfying sales outcome. Another important feature of this model is that easily allows for the planning and execution of successive sales calls. It offer the capability of ending a call at a certain point in the process and then picking up from that point on the next call. Customer-Focused Selling to meet you specific training objectives. The Customer-Focused Selling training format described here is designed to be tailored to your organization's specific sales training needs. We will work with your managers and other stakeholders to create and implement a Customer-Focused Selling training initiative whose results will not only exceed your expectations, but whose impact will be measurable through established business metrics. We utilize those concepts that we and our clients jointly percieve to be most relevant to the needs of yoursales people and sales managers. As with all of our training programs, we include a segment on effective goal-setting and personal motivation. Our training programs can be delivered in a variety of formats to suit your business needs.